Donkey Kong is a playable character in the Brawl mod Project M. In Project M, Donkey Kong was remade as a buffed version of his Melee counterpart. Donkey Kong is currently ranked 11th out of 41 on the official tier list, placing him in the higher half of the A- tier. This position is significantly higher than his Melee and Brawl placements, where he was 17th out of 26 and 21st out of 38, respectively. Donkey Kong falls under the generic super heavyweight archetype, boasting slow but powerful attacks. What sets Donkey Kong apart is his surprisingly fast dashing speed, a fast falling speed (making him one of the only two fast-fallers to be heavyweight, alongside Captain Falcon), an average air speed, and decent attack reach. As a result of his weight (he is the second heaviest, being second only to Bowser) and falling speed, Donkey Kong inherits the second best horizontal and third best vertical endurance, losing only to Bowser horizontally and Captain Falcon and Wolf vertically. Donkey Kong has a unique throw that allows him to carry opponents on his back. He is able to walk in either direction, jump, and throw in any direction while he has an opponent in cargo. The up throw out of cargo is notorious for setting up both combos and KOs, especially on fast-fallers. Donkey Kong has many moves with decent range like his back air and his Hand Slap, the latter of which is great at tech chasing, as it can cover multiple options at once. With his heavy damage and knockback-dealing moves and his aerial and grab combos, Donkey Kong does not have much trouble setting up a hit with his forward aerial, his Giant Punch, or any of his other powerful finishers. Donkey Kong is one of the strongest fighters in the game, possessing a myriad of reliable and powerful finishers in his repertoire. His unusually fast mobility, combined with his power, allows him to execute devastating combos. Donkey Kong's aerial game is above average, as his array of aerial attacks have great utility and strength. His forward and down aerials send his opponents downwards, with the latter being a strong meteor smash (especially with his foot) and the former being a powerful spike with the late hitbox. He also has incredibly deadly options out of shield. However, Donkey Kong suffers from approach issues. A combination of a long jump squat and an above average traction gives him a slow and short wavedash. Additionally, while his high weight and falling speed make him difficult to KO off the stage horizontally and vertically, said factors also make him easy to combo, an issue compounded by his large size. Additionally, while Donkey Kong has an above-average horizontal recovery in Spinning Kong, the move is among the worst in terms of vertical distance. Donkey Kong's greatest weakness, however, may be his lack of means to combat projectiles. As a large target, Donkey Kong is forced to play aggressively against projectile users, who may have the ability to punish Donkey Kong if he gets close. Donkey Kong in his Punch Out!! outfit. Most of Donkey Kong's attacks involving his arms or head have new hit SFX. Donkey Kong dashes slightly faster (1.6 → 1.8), now running as fast as Marth, Pikachu, and Sheik. Most attacks retain their Arm Intangibility from Brawl. Most arm bases attacks have had their hitboxes adjusted to cover his whole arm, where as in Melee most of the said hitboxes failed to do so, this greatly improves Donkey Kong's overall range and spacing capabilities. Jab 1 has more base knockback (0 → 1). Jab 1 has less start-up (Frame 5 → 3). Up tilt has less ending lag (IASA 40 → 36). Down tilt deals more damage (7% → 9%) and has higher knockback (10 (base)/80 (growth) → 25/95). Forward smash's sweetspot has slightly more base knockback (22 → 30). Up smash has slightly more knockback growth (93 → 98). Dash attack has been changed. It is now a roll similar to that of the Donkey Kong Country series. It acts much like the original one, but has light armor and can roll off edges and platforms similar to Kirby's Melee dash attack. Can be jumped out of in midair. The move has more utility overall than the old dash attack. Neutral aerial has more range and has less startup (frame 10 → 7). Neutral aerial's animation has been slightly altered where Donkey Kong stretches out his arms more, further improving it's range. Forward aerial comes out faster (frame 25 → 22) and has more KO potential, and its late hitbox now spikes opponents instead of meteor smashes, meaning it cannot be meteor canceled anymore. Up aerial has a longer duration (3 frames → 4). Down aerial's ending lag has been shortened. Back throw's knockback has increased, making it a reliable KO move against light characters. Hand Slap now has much wider grounded hitboxes that ground-bounce the opponent and only slaps the ground twice per button press (making it optionally much shorter); it functions well for shield pressure and tech-chasing. Giant Punch no longer causes DK to become helpless if used while airborne. Headbutt no longer meteor smashes, as it now spikes opponents, thus improving his edgeguarding potential. All aerials except down aerial are weaker, having reduced damage and knockback. Can no longer jump cancel when using a grounded dash attack. Arm invincibility in Giant Punch changed to intangibility to remove hitlag when interacted with an opponent's attack. Arm invincibility in grounded Spinning Kong changed to intangibility to remove hitlag when interacted with an opponent's attack. White costume's tie is made blue as a reference to Super Kong in Donkey Kong Country Returns. Headbutt's angle for both grounded and aerial changed from 290 and 315, respectively, to 300. Up to date as of version 3.6. 4% Donkey Kong performs a quick cross punch followed by an uppercut. 12% Donkey Kong quickly swats nearby foes with his outstretched hand. Donkey Kong's extended arm is intangible while the hitboxes are out, allowing it to be used safely against most other attacks. This move can be aimed up or down. 9% (hand), 10% (arm), 11% (shoulder) Donkey Kong quickly swipes his hand in the air. Fast with a good arch range. Again, DK's arm cannot be injured while the hitboxes are out. Slouch Slap 9% Donkey Kong does a quick swat across the ground. 10% (clean), 7% (late) Donkey Kong performs a rolling attack similar to that of the Donkey Kong Country series. This move has light armor and can roll off edges and platforms. 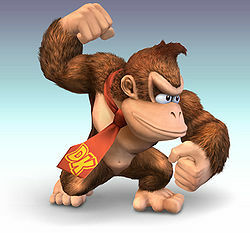 18%-19% (body), 20% (hands), 21% (arms) Donkey Kong performs a very forceful clap with both hands. 18% (hands), 16% (body) Donkey Kong claps both his hands above his head. This move has great vertical reach, but will fail to hit a nearby enemy due to its poor horizontal range. One of the strongest up smashes in the game. Both of DK's arms and his head are intangible while the hitboxes are out. 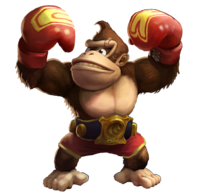 16% (close), 17% (far) Donkey Kong performs a double back-handed punch by bringing both his closed fists down 90° at both sides. Both of DK's arms are intangible while the hitboxes are out. 14% (clean), 10% (late) Donkey Kong quickly spins with his arms extended. 17% Donkey Kong puts his fists together above his head, and then does a powerful ax-handle smash. This move sends enemies downwards the moment Donkey Kong swings his arms in front of his face. However, unlike in Melee, this move is now a spike rather than a meteor smash, meaning it can no longer be meteor-canceled. 13% (clean), 9% (late) Donkey Kong performs a quick kick directed behind him that lingers briefly. 14% Donkey Kong performs a quick headbutt upwards. A great juggling move. 16% (foot), 13% (body) Donkey Kong performs a downward stomp whilst holding his arms up in a macho pose. Serves as a meteor smash should it hit. 3% A fairly quick slap. Kong Karry 6% (breakout), 9% (forward & back throw), 7% (up throw), 6% (down throw) Donkey Kong cradles the opponent on his back, allowing him to move and jump around while still holding the victim. Then, he can perform any of the following throws listed below. Forward: Tosses the opponent forward. Back: Tosses the opponent behind him. Up: Tosses the opponent upwards. Can chain grab fastfallers. Down: Tosses the opponent forward like a bowling ball. 11% Donkey Kong swings his arm back and throws the opponent. 9% Donkey Kong throws the opponent upwards. 7% Donkey Kong slams the opponent onto the ground with his hand. 6% Donkey Kong gets up and swats both sides of himself. 6% Donkey Kong gets up and claps once both sides of himself. 5% Gets up and does a wind-up spin around the floor. 8% Donkey Kong throws his rear at the opponent. 10% Donkey Kong slowly climbs onto the stage and swats forward. Giant Punch 12%/10% (uncharged), +2% per windup, 28%/30% (fully charged ground), 25%/27% (fully charged air) Donkey Kong winds up and thrusts out his arm as a potentially powerful attack. The attack is at fully charged after eleven windups and gains invincibility frames right before he unleashes the punch. The attack itself has good range and decent speed. Headbutt 8% (bury), 10% (grounded), 14% (aerial) Donkey Kong slams his head downward. When performed on a grounded opponent, they will be buried and will remain submerged the more damage they have taken. Like with his forward air, this attack was changed from a meteor to a spike (270° to 300°). Air: 10% (startup), 4-5% (loop early), 2% (loop late) Donkey Kong spins in the air, getting great horizontal distance, but little distance vertically. Donkey Kong gains invincibility frames during the startup of this move. Hand Slap 12% Donkey Kong repeatedly slaps his hands against the ground, causing earth-shaking vibrations in the process. This attack gives him some protection from opponents while grounded due to its good range but cannot hit airborne opponents. This move cannot be used in the air. Konga Beat Varies Donkey Kong takes out a pair of bongos and begin to play them to the beat of "DK Island Swing", sending out shock-waves in the process. The attacks range and power is determined by the player's input. The player must push the attack button in succession with the song's beat in order have the greater range and power. J$ - Ranked 2nd on the Idaho Project M Power Rankings. King Koney - Ranked 6th on the Connecticut Project M Power Rankings. Placed 17th at Blacklisted 3 and 49th at The Bigger Balc. Noghrilla - Ranked 2nd on the Florida Project M Power Rankings. Placed 2nd at Tipped Off 12 after defeating Twisty, Silver, BaconPancakes, and Jfyst. POOB - Notably placed 4th at The Flex Zone after double eliminating Aklo, eliminating StereoKiDD, and bringing Professor Pro to game 5 last stock. Peachwave - The best midwest Donkey Kong main. Ranked 10th on the Michigan Project M Power Rankings. ThundeRzReiGN - The best player in the world and, by extension, the best Donkey Kong main in the world. Ranked 1st on the PMRank 2016. Sora (AU) - One of the best Australian Project M players. Ranked 1st on the Australian Project M Power Rankings. Donkey Kong has an alternate costume based on his secret boss fight in the Wii version of Punch-Out!! The costume has no gameplay effects. It also has green and blue recolors so that it can be used in Team Battles. His green recolor for the Punch-Out!! outfit is based off of Little Mac. Donkey Kong is one of the only two characters to be equipped with two spikes, alongside Roy, who coincidentally shares the same falling speed. This page was last edited on January 9, 2019, at 22:46.